On Thursday, judges ordered authorities to release nine political dissidents and restore the seats of 12 legislators who had been sacked for defecting from Yameen's party, ruling the cases were politically motivated. 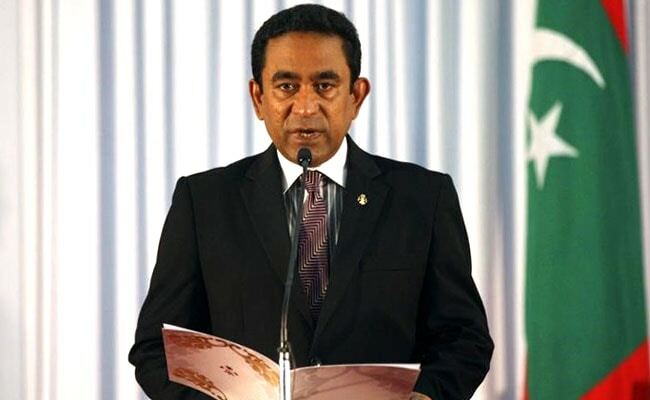 Male, Maldives: The beleaguered Maldives government Sunday ordered police and troops to reject any move by the Supreme Court to arrest or impeach President Abdulla Yameen over his refusal to release political prisoners. The tiny tourist archipelago has been plunged into a political crisis pitting the country's top court against Yameen, whose crackdown on dissent has tarnished the nation's image as an upmarket holiday paradise. On Thursday -- in a move that surprised many -- judges ordered authorities to release nine political dissidents and restore the seats of 12 legislators who had been sacked for defecting from Yameen's party, ruling the cases were politically motivated. But the Yameen government has so far refused, shuttering parliament and resisting international calls to comply. In a national television address on Sunday Attorney General Mohamed Anil said the government remained defiant. "Any Supreme Court order to arrest the president would be unconstitutional and illegal. So I have asked the police and the army not to implement any unconstitutional order," Anil said. The reinstatement of the dozen legislators gave the opposition a majority in the 85-member assembly, and it can now potentially impeach Yameen. However the authorities shut parliament indefinitely on Saturday to avert such a move. Yameen also sacked two police chiefs after the court's decision. The main opposition Maldivian Democratic Party -- led by the country's first democratically-elected president Mohamed Nasheed -- has urged the government to respect the top court's decision, fearing any refusal might trigger unrest in the nation of 340,000 Sunni Muslims. The Maldivian government said Friday it had concerns about releasing those convicted for "terrorism, corruption, embezzlement, and treason". The United Nations, Australia, Britain, Canada, India and the United States welcomed the court's decision as a move towards restoring democracy in the politically troubled Indian Ocean nation. Nasheed was barred from contesting any election in the Maldives after a controversial 2015 terrorism conviction which was internationally criticised as politically motivated. He lives abroad after travelling out of the country in 2016 on prison leave for medical treatment.